NEW ORLEANS – Fall is right around the corner, which means cross country is back! Before too long, teams around the nation will be engaged in competition culminating in the 2018 NCAA Division III Cross Country Championships on November 17 in Oshkosh, Wisconsin. And for those teams to make it to NCAAs, they must fare well at various regional sites one week earlier. 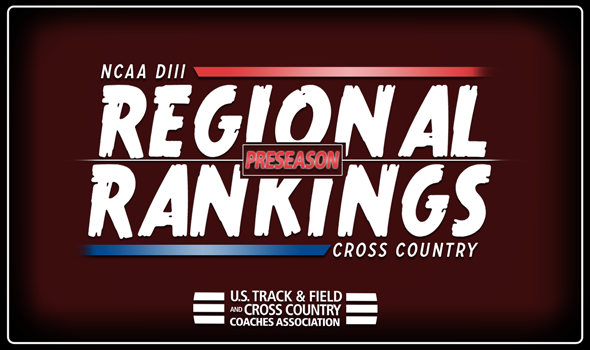 The U.S. Track & Field and Cross Country Coaches Association (USTFCCCA) released the NCAA Division III Men’s Cross Country Preseason Regional Rankings on Tuesday. Remember: USTFCCCA Regional Cross Country Rankings are determined subjectively by a single member coach in each respective region. The regional representative is tasked with weighing returning teams’ strength with current season results (if applicable) in determining a predicting finishing order at the NCAA Regional Championships. RPI is the top dog in the Atlantic Region and justifiably so. The Engineers return three of their top-4 runners from last year, including Grant O’Connor (4th at NCAAs in 2017). This is the first time in the history of the Regional Rankings that RPI holds down the top spot. SUNY Geneseo sits second in the region after graduating four of its top-5 athletes from the NCAA meet last year. The Knights had been ranked on top of the Atlantic Region in each of the previous 20 iterations of this index. RIT, Saint Lawrence and Rowan come in at third, fourth and fifth, respectively. All three of those teams return a healthy contingent of runners from last year and added key newcomers. For the fifth year in a row, SUNY Geneseo tops the Atlantic Region in the preseason. The Knights will be led by Elise Ramirez, who dropped her PR in the 5000 to 16:52. Ramirez will be closely followed by five other women who return from last year’s sixth-place team at NCAAs. Ithaca is No. 2 and will adjust to life without perennial individual contender Taryn Cordani. The top returning athletes for the Bombers are Sierra Grazia, who finished 134th last year at NCAAs, and Emilie Mertz, who wasn’t too far behind her in 140th place. RPI, TCNJ and St. Lawrence come in at third, fourth and fifth, respectively. Big things are expected out of Carleton this year. The Knights are ranked No. 1 in the Central Region for the first time in program history (Actually, Carleton hasn’t been ranked higher than third since Week 1 of 2015. It’s too close to call between Wartburg and Cornell, the No. 2 and No. 3 teams, respectively. The Knights got the edge thanks to their strong front-running from Sam Pinkowski, who took seventh this past May in the 5000 at the NCAA Outdoor Championships. Loras and St. Olaf rounds out the top-5 in fourth and fifth, respectively. Carleton is expected to repeat as champion of the Central Region despite losing its top-2 runners. The Knights return the rest of their scoring lineup, including Amanda Mosborg (61st place last year) and Samantha Schnirring (120th place). St. Thomas (Minn.) made a huge jump from last year. The Tommies are slotted to finish second in the region after a fifth-place finish last year and a 22nd-showing at NCAAs. Wartburg, Nebraska Wesleyan and Gustavus Adolpuhs come in at third, fourth and fifth, respectively. Calvin and DePauw begin the 2018 season the same place they left off at the Great Lakes Regional Championships last year – first and second, respectively. The Knights lost their top-2 runners from last year, but return their third, fourth and fifth runners. Caleb Ferguson had a strong season on the outdoor circuit for Calvin as he finished seventh at the NCAA Championships in the steeplechase. The Tigers return a formidable lineup, even though they lost their top runner from last year. DePauw will be led by Paul Christian, who finished 37th last year, and Samuel Voelz, who took fourth in the 800 at the NCAA Championships this past May. Albion, Otterbein and John Carroll rounds out the top-5 in the third, fourth and fifth. Allegheny peaked at the right time last year and that’s why they’re on top of the Great Lakes Region in 2018. The Gators improved upon a third-place finish at the regional meet with a 13th place finish at NCAAs. Sarah Hevener is the top returner from last year’s squad (She finished 82nd at NCAAs). Next up is Otterbein, a team that returns its entire top-7. The Cardinals welcome back Claire Lamb and Heather Sandvik, who finished third and fourth at the regional meet last year. Hope, Oberlin and Calvin come in at third, fourth and fifth, respectively. Haverford leads the Mideast Region into the 2018 season. Dylan Gearinger, who won the 3000 at the NCAA Indoor Championships last March, headlines a strong group of returning athletes for the Fords. Don’t forget about last year’s individual region champ Graham Peet or third-place finisher Ryan Herlify, either. Carnegie Mellon comes in at No. 2 with a strong roster. The Tartans lost very few athletes from a team that finished 21st at NCAAs last year and welcome back William Mitchell, their top runner from 2016, who had to sit out 2017 with an injury. Johns Hopkins, Messiah and Dickinson rounds out the top-5 in third, fourth and fifth. The Mideast Region belongs to Johns Hopkins until further notice. The Blue Jays have been ranked No. 1 for the past 67 weeks. In fact, Johns Hopkins has never been ranked anything other than No. 1. Last year the Blue Jays steamrolled through the season and won by 95 points at the NCAA meet. Johns Hopkins returns Ellie Clawson (third at NCAAs), Natalia LaSpada (23rd at NCAAs) and Therese Olshanski (29th at NCAAs), among others. Dickinson adds a few talented freshmen to an already deep roster. The top returner from last year’s NCAA team is Tessa Cassidy, who finished 73rd in 2017. Carnegie Mellon, Elizabethtown and Haverford come in at third, fourth and fifth, respectively. Surprise! North Central (Ill.) is atop the Midwest Region once again. This marks the eighth year in a row that the Cardinals topped the region to begin the season. North Central (Ill.) has a deep roster and returns three of its top-5 runners from a team that dominated NCAAs last year, including Al Baldonado and Dhruvil Patel. UW-La Crosse is No. 2 to begin the season for the third time in program history (2013 and 2017). The Eagles gelled as the cross country season progressed last year and fared well on the outdoor track. UW-La Crosse will feature a potent one-two punch in Thomas Schultz and Ian Ewers. Here are the rest of the teams in the top-5, in order: Washington (Mo. ), UW-Stout and U of Chicago. It’s going to be a dogfight atop the Midwest Region between Washington (Mo.) and UW-Eau Claire. The Bears are No. 1 in the preseason to the Blugolds’ No. 2. Wash U returns Aly Wayne, who missed last year due to injury but finished ninth at NCAAs in 2016. Wayne will be joined by Paige Lawler (15th at NCAAs last year) and Sophie Watterson (41st at NCAAs), among others. UW-Eau Claire returns four of its top-7 runners from NCAAs last year, including Sam Slattery (17th) and Morgan Marek (63rd). Wheaton (Ill.), UW-La Crosse and UW-River Falls come in at third, fourth and fifth, respectively. This might very well be the deepest region in the nation. Amherst, MIT and Middlebury all have a claim to the top spot – but the Mammoths headline the group in the preseason. It’s Amherst that lost only one scorer from a team that was fourth at NCAAs last year and won the NESCAC team title. The Mammoths fared well during the track circuit and added a transfer from NCAA DI Penn as well as a few talented freshmen. The Engineers are the defending champs in the New England Region and return four of its top-7 runners. MIT struck gold in the offseason when it landed Andrew Mah, who won the 5000 at New Balance Nationals this past June. The Panthers welcome back a large group of athletes from a team that finished runner-up at NESCACs and 15th nationally. Williams and Connecticut College rounds out the top-5 in fourth and fifth. Take your pick when it comes to who could come out of the New England Region as the champ. It’s going to be a four-way battle between MIT, Middlebury, Williams and Tufts. The Engineers are ranked No. 1 to begin the season thanks to their returning depth. MIT returns Leandra Zimmerman (30th last year at NCAAs) and Megan McCandless (58th), among others. This is the second year in a row that the Engineers have been ranked No. 1 to begin the season and the 26th time in program history. The second-ranked Panthers finished 11th at NCAAs last year and should be around that spot or higher again if they can pack up around Abigail Nadler, who finished seventh last year. Rory Kelly is the next top returner back for Middlebury after finishing 88th last year. The third-ranked Ephs and the fourth-ranked Jumbos are expected to contend for a regional title, as is fifth-ranked Bates. All roads in the South/Southeast Region lead through Rhodes. The Lynx is the top-ranked team to begin the season as they return several athletes from last year’s team that rallied to finish 24th at NCAAs in 2017. Spencer Fields could be the top runner for Rhodes, as he was ninth outdoors in the 10,000 with a time of 31:10.21. Emory sits second in the preseason and has a strong core back from a team that finished in the top-3 at the regional meet last year. The Eagles’ top returning athlete is Shane Sullivan, who finished 137th at NCAAs in 2017. Christopher Newport, Washington & Lee and Bridgewater (Va.) rounds out the top-5 in third, fourth and fifth. Emory is No. 1 in the preseason, but will have to make up for the loss of 2017 individual region champ Gabrielle Stravach. The good news is that the Eagles had a strong outing on the track circuit to build their base and packed up well in the cross country postseason last year. Lynchburg returns their entire top-7 in 2018. Four of their athletes boast sub-19 minutes PRs in the 5000. Trinity (Texas), Centre and Washington & Lee come in at third, fourth and fifth, respectively. For the third year in a row, Pomona-Pitzer is No. 1 in the preseason. The Sagehens return five of their top-7 runners from a team that placed sixth at NCAAs last year, including multiple time All-American Andy Reischling. He will be backed up by at least nine returners who have run sub-26:00 times. UC Santa Cruz sits second to begin the season. The Banana Slugs aren’t slow by any stretch of the imagination and will look to prove it against a loaded schedule. Last year at NCAAs, UC Santa Cruz finished 26th as a team. Claremont-Mudd-Scripps, Occidental and Willamette rounds out the top-5 in third, fourth and fifth, respectively. Claremont-Mudd-Scripps graduated four of its top-7 runners, but expectations are high. The Athenas’ top returning athlete is Malea Martin and she will be flanked by Abby Johnson and a host of newcomers. Graduation took a toll on Colorado College’s roster, but the team should be back to its old ways before too long. This is the second time the Tigers have been ranked second to begin the season (The first time was back in 2016). Puget Sound, Whitworth and Whitman come in at third, fourth and fifth, respectively.